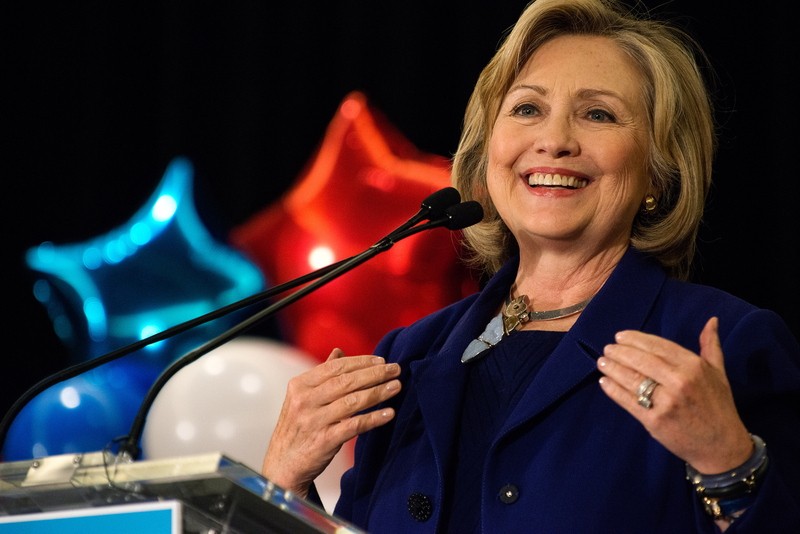 The news is out (although you're not surprised): Hillary Clinton is running for U.S. president in 2016. It's possible that things may look very different for her than they did in 2008 when she last tried her hand at the nomination. However the road ahead will look for Clinton, regardless of whether or not a worthy opponent surfaces, one thing is for sure — we have a long way to go until the election, and it's going to be exhausting. Anyone who has spent as much time with The West Wing or Veep as I have (or, of course, anyone who's followed politics closely) will know that the slog through the primaries and on to the general election is not all inspiring speeches and hard-hitting debates — there are many long flights, cold hotel rooms, and bumpy bus rides to fill in the gaps in the schedule. Although there will no doubt be countless strategy sessions and syndicated interviews to take up the down time, there's nothing like a good book to take the edge off of another long day. So, as Hillary Clinton gears up to hit the campaign trail hard, these 16 suggestions for on-the-road reading might just help put the tribulations of the 2016 campaign into perspective. After all, what pairs better with a long road trip than the perfect book? It's not hard to imagine how quickly an endless stream of handshakes, speeches, and catered lunches will dull the senses and dampen the campaign spirit. Hunter S. Thompson's timeless account of a reporter's drug-fueled race across the country on the campaign trail with George McGovern back in '72 is sure to keep Clinton motivated and amused throughout all the monotony. Clinton can lay claim to just about as much leadership experience as any woman out there, but as she pointed out at the end of her last presidential campaign, America's “highest, hardest” glass ceiling has yet to crack. Sandberg's influential memoir should provide both solidarity and inspiration as Clinton seeks to prove that power is not synonymous with patriarchy. Tripping over words, deeds, and past mistakes is par for the course when you're a presidential nominee. Personally, I prefer Clinton at her most honest and unapologetic, so in the spirit of audacious women who always speak their mind, I can only hope our first serious female presidential nominee will consider spending some time with the fierce, fun-loving, feminist Anne of Green Gables on the campaign trail. As long as Clinton steers clear of the raspberry cordial it's hard to imagine how Anne could be anything other than a powerful positive influence. Yes, Clinton and Obama are totally different people — but surely there's something to be learned from the charismatic vision Obama imparted with his initial bid for the presidency way back in 2008. As a veteran of the political arena (not a popular legacy among the American populace at this particular moment), Clinton needs to inspire as much passion as she possibly can. So why not take a few free hours on the road to learn from the master? Clinton has always been conscious of her place in history and her role as an inspiration to women young and old. Of course, as candidates are forced to appeal to the masses, it can be all-too-easy to lose touch with the less privileged. Reading Jill Lepore's stunning biography of the illustrious Benjamin Franklin's beloved sister Jane may just be the perfect way to connect with the inequality that still governs the lives of so many women across the country. The delicious prose and engrossing historical narrative are just the cherry on top of this literary sundae. If Clinton manages to make it past Super Tuesday and on to success in the general election, she will, at some point, actually have to govern. There's no literary model for success in office that makes a more engaging read or a more worthy example than Doris Kearns Goodwin's exploration of the Lincoln presidency. At a time when posturing and political theatre seem to have taken the place of the democratic process, what could possibly make better reading than a thorough exploration of one president's extraordinary handling of clashing opinions and worthy adversaries? Stale sandwiches, moist handshakes, and TV cameras may be ubiquitous on the campaign trail, but humor is almost certainly in short supply. For a warm, witty way to wind down after a long day without wandering too far from the political base, I hope Ms. Clinton will consider Tina Fey's delightfully funny feminist manifesto: Bossypants. Nothing is quite as inspirational as a brief consideration of the possibilities of failure. For a bleak look at a world without women holding high office (or really any office whatsoever), you can't do better than Margaret Atwood's dystopian masterwork The Handmaid's Tale. If a little time in the world of Offred doesn't light a fire under Ms. Clinton, then surely nothing will. Hubris is not just for Homer and the many men of Shakespeare — presidential politicians seem uncommonly affected by this particular weakness. For a lesson in the very real dangers of the pride that commeth before the fall, Carl Bernstein and Bob Woodward's classic tale of American crime in the halls of power cannot be beaten. A few hours with the story of Nixon's slow fall from grace in between stump speeches might be just what Ms. Clinton needs to keep her honest as she flies ever closer to the sun. In addition virtually endless entertainment, J.K. Rowling's Harry Potter series also offers a portrait of leadership worthy of any aspiring president. From Dumbledore's wisdom and universal love to Harry's embrace of making the hard choices, there's quite a bit to learn from the Potterverse. And, if spending some time in Ms. Rowling's wild, wonderful world provides a bit of an escape from the day to day— well, that's just icing on the cake. Robbert Penn Warren's All the King's Men is not only one of the greatest American novels ever written, but also a worthy tale of warning for any presidential hopeful. The lure of power and influence are strong, especially in the modern era of limitless campaign contributions and the ever-present Super PAC, but high political office and rampant corruption have been uneasy bedfellows for as long as men have placed authority in the hands of other men. Because these days the checks and balances are as unsteady as they have ever been, Clinton would do well to consider the many ways in which power corrupts by spending a little time with Warren and this epic tale of one young boy's rise to power as a political boss. With some truly startling stories about the travels made by the original supreme court justices across the newly founded nation, Sandra Day O'Connor's sumptuous history of the original Supremes is the perfect book to put the discomforts of the modern campaign trail into perspective. One strong woman deserves the company of another, which makes Jane Eyre the perfect bus book for the Hillary Rodham Clinton campaign. As a strong woman who stands her ground ahead of her time, Jane is not only a worthy companion for Clinton but also, quite possibly, a welcome role model. Ms. Clinton has been the subject of no small amount of scrutiny throughout her tenure in the White House, her time as Senator, and most recently her years of service as Secretary of State. As one of the most famous literary targets of scorn and derision, Hester Prynne's struggles certainly mirror Ms. Clinton's own in more than a few small ways. For those long nights in foreign hotel rooms when the world seems entirely against you, Ms. Clinton, I cannot recommend The Scarlet Letter highly enough. Zora Neale Hurston's rich, female-focused novel Their Eyes Were Watching God is not only the story of one strong woman's sorrows and triumphs, but also an important link to the very real power struggles and structural inequalities that make up the history of our country. As an important distraction from all of the banalities of daily campaign life and a welcome reminder of the difference one strong woman can make, Hurston's epic novel is perfect fodder for the first serious female presidential nominee in the entire history of these United States.